Infor EAM is a best-in-class and highly configurable asset management software solution designed to improve the efficiency of various industries which include transit, utilities, manufacturing, public sector, healthcare, chemicals and life science, and food and beverage. The solution is among the top enterprise asset management software solutions evaluated by Gartner, Inc. in 2017, a world-leading research and advisory company the conducts researches and provides businesses with insights into technology products that have a high ability of execution. Furthermore, Infor EAM is built on a modern, scalable, and dynamic architecture which can adapt to one’s business needs and has an extensible computing power, ensuring high uptime and meeting the needs of companies and businesses as they grow. Equipped with industry-specific capabilities, Infor EAM is available in multiple editions that are extensively customized for different industries. It is built with robust features such as the ability to plan asset maintenance activities, improve asset performance and reduce equipment cost, increase asset visibility, provide detailed inventory of assets, track and monitor the condition and location of expensive equipment, generate complete audit reports, and validate data on assets to improve compliance with standards and regulations. Infor EAM is a highly configurable enterprise asset management software solution which is built and developed to cater to the needs of various industries. Because of this, the solution comes with built-in tools and capabilities that streamline key asset management tasks and increases the efficiency of companies, organizations, and businesses; regardless of the industry they belong. Infor EAM offers industry-specific capabilities that are beneficial for transit organizations, public and private utilities, manufacturers, public institutions, healthcare providers, pharmaceutical and chemical manufacturing companies, and food and beverage companies. The enterprise asset management software can organize assets based on hierarchy. Thus, it enables users to see how their equipment, systems, and locations connect or relate to one another. Through asset hierarchy, they will be able to quickly define and plan the maintenance and repair activities needed so that their assets are able to meet safety regulations; and they can manage risks efficiently. To ensure the compliance and reliability of their assets, the software can send alerts as users conduct compliance inspections. Infor EAM introduces a modern asset maintenance management system that enables users to easily track all their assets and access information about them. This way, they will be able to eliminate production delays, and plant and equipment downtime. Also, the software allows them to ensure that their assets are performing well and operating safely while being able to control costs efficiently. They can predict future capital allocations and discover how they impact their finances and capability to produce products and services. Infor EAM also provides capabilities that maximize the value and lifecyle of government assets. For instance, it allows government agencies to take advantage of innovative technologies so that they can automate and optimize their asset management tasks, workflows, and processes. They can also monitor and record requests for service. Although operating with limited revenues, local departments and government agencies will be able to keep their assets safe and reliable and make sure that they are performing based on design standards; meeting the demands of their constituents. The asset management software solution enables medical facilities and healthcare organizations to track the location and condition of all of their medical equipment so that they can deliver better patient care and healing care environment. Also, it assists them in responding to the challenges being brought upon by rapidly changing healthcare regulatory standards. They can keep their buildings and facilities safe and highly functional, and enhance their hospital operations. Infor EAM is built with a set of features dedicated to pharmaceutical and chemical manufacturers or those who belong to the chemical and life science industries. Among these features are electronic signatures, audit trails, electronic records, tamper detection, and employee certification, and calibration. Summing it up, Infor EAM offers reliable features that food and beverage companies can take advantage of. As an example, it has a built-in data validation capability which permits them to collect data about their equipment, facilities, and machinery and other assets accurately. They will be able to trace data from any point within the solution through the aid of its integrated modules. If you are interested in Infor EAM it could also be beneficial to analyze other subcategories of Best Fixed Asset Management Software listed in our base of SaaS software reviews. Since each enterprise has unique business requirements, it is advisable for them to refrain from searching for a one-size-fits-all perfect software system. Needless to say, it would be useless to try to find such a platform even among widely used software applications. The clever thing to do would be to list the various essential aspects that require consideration such as main features, budget, skill levels of employees, company size etc. Then, you should do your groundwork thoroughly. Read some Infor EAM reviews and check out each of the other apps in your shortlist in detail. Such comprehensive research can ensure you discard ill-fitting systems and choose the system that provides all the aspects you need for business success. 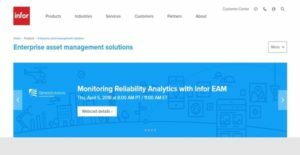 How Much Does Infor EAM Cost? Infor EAM’s SMB and enterprise pricing plan information is available only upon request. For more information and to get a quote, please contact its sales team. We realize that when you make a decision to buy IT Asset Management Software it’s important not only to see how experts evaluate it in their reviews, but also to find out if the real people and companies that buy it are actually satisfied with the product. That’s why we’ve created our behavior-based Customer Satisfaction Algorithm™ that gathers customer reviews, comments and Infor EAM reviews across a wide range of social media sites. The data is then presented in an easy to digest form showing how many people had positive and negative experience with Infor EAM. With that information at hand you should be equipped to make an informed buying decision that you won’t regret. What are Infor EAM pricing details? What integrations are available for Infor EAM? If you need more information about Infor EAM or you simply have a question let us know what you need and we’ll forward your request directly to the vendor.